It's a question mankind has been asking ever since we've struggled to understand our place in the universe: Can a human beat a robot at Ping-Pong? 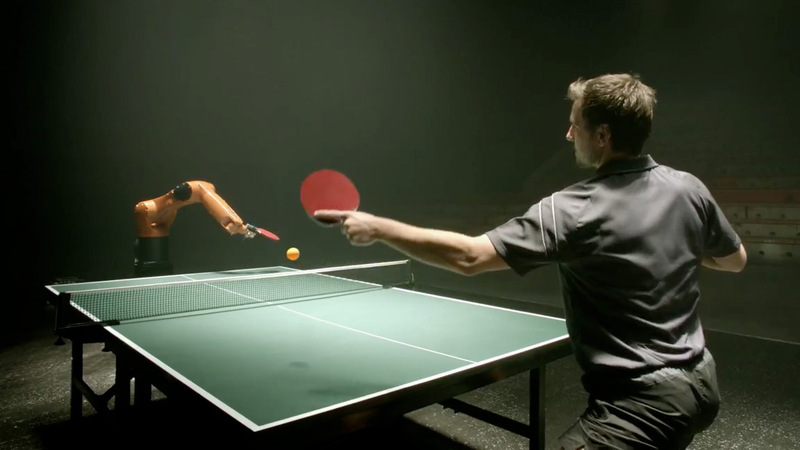 Robotics manufacturer KUKA decided to find out by pitting one of its most advanced devices against German table-tennis legend Timo Boll, one of the world's top 10 players. The resulting short film, while clearly not a documentary and likely staged every step of the way for dramatic effect, is an enjoyably cinematic piece of marketing for the company's new production facility, opening this week in Shanghai. Director Matthias Zentner says the video was shot in an abandoned athletics venue in Sofia, Bulgaria. "Agilus, the world's fastest robot, was programmed for all kind of moves in order to withstand the challenging match against Timo Boll," Zentner writes in his Vimeo summary of the production. We'll see if Zentner is still so proud of this accomplishment when we're all cowering in the ruins left by Skynet and its army of paddle-wielding bots. While many people will find this video overproduced and somewhat misleading (the robot's not really responding to unpredictable plays), you have to admit it's the best ad you've ever seen for a German robotics company opening a factory in China.